The Superman Fan Podcast: Episode #289 Part I: Superman Family Comic Book Cover Dated December 1959: Superman's Pal Jimmy Olsen #41! Episode #289 Part I: Superman Family Comic Book Cover Dated December 1959: Superman's Pal Jimmy Olsen #41! Superman's Pal Jimmy Olsen 41! Download Episode 289 Part I! 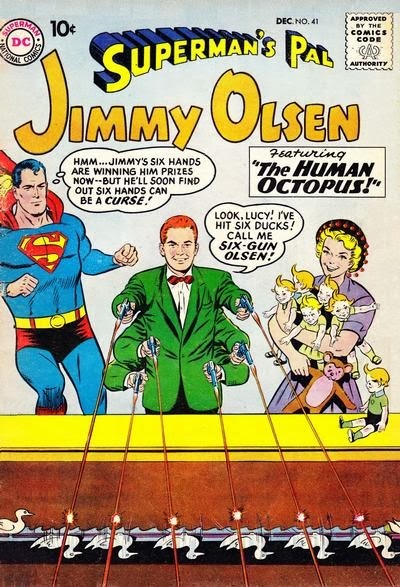 SUPERMAN'S PAL JIMMY OLSEN 41, December 1959, was published on October 6, 1959. It contained 32 pages for the cover price of 10¢. The editor was Mort Weisinger, and the cover was pencilled by Curt Swan and inked by John Forte, featuring the issue's first story. All three stories in this issue have beenreprinted in SHOWCASE PRESENTS: SUPERMAN FAMILY vol. III. - THE HUMAN OCTOPUS (9 pgs. ), written by Robert Bernstein, pencilled by Curt Swan and inked by John Forte. This story was also reprinted in THE AMAZING TRANSFORMATIONS OF JIMMY OLSEN. - THE ROBOT REPORTER (8 pgs. ), written by Otto Binder, pencilled by Curt Swan and inked by Stan Kaye. - JIMMY OLSEN, THE BOY SWORDSMAN (9 pgs. ), written by Otto Binder, pencilled by Curt Swan and inked by John Forte. Also featured in this episode are the ads and other features found in this issue, including the letter column, JIMMY'S PEN-PALS. Elsewhere In DC Comics cover dated December 1959 will be highlighted in the next episode: SUPERMAN FAMILY COMIC BOOK COVER DATED DECEMBER 1959 PART II: WORLD'S FINEST COMICS 106! In 2 Weeks: SUPERMAN COMIC BOOKS COVER DATED NOVEMBER 1962 PART I: SUPERMAN 157! In the final episode of the year in 3 weeks will be the traditional year end episode: SUPERMAN 2013: YEAR IN REVIEW! 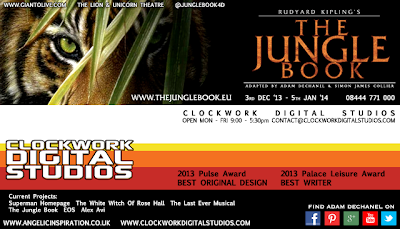 Adam Dechanel, writer for the Superman Homepage, is the writer and co-producer of THE JUNGLE BOOK, a theatrical adaption of the classic Rudyard Kipling story, at a London Theater this holiday season. 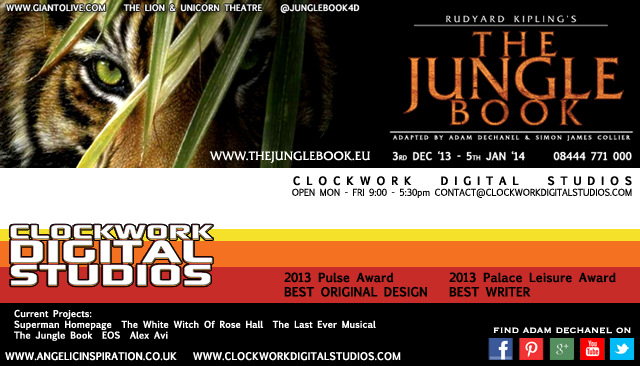 For more information, go to http://www.thejunglebook.eu/.